"It's my favorite show!!" Here is Adam with his Mach V playset (with Speed, Spridle and Chim-Chim), his Mach V Speed Hopper (yes, the switch is already broken) and the 8 piece Jack in the Box set. Thank goodness for eBay!! I used to watch it after school...I forget the other shows that were on around it. 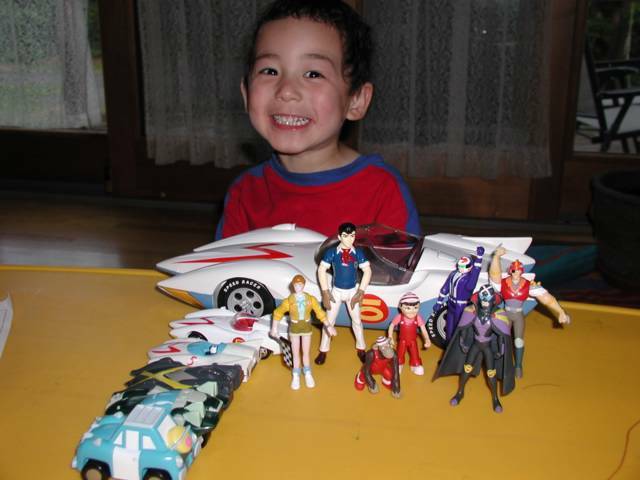 I just looked on EBay and what a shock...tons of Speed Racer stuff!